In “Ten Days That Shook the World”, John Reed presents his eye-witness accounts of the Bolshevik Revolution. From the March Strikes until the formation of the Soviet government, Reed provides a detailed historiography of the Bolshevik Revolution by basing himself on documentation such as press releases and news papers while at the same time exposing the reader to his own personal observations and interpretations of the events. Reed’s work incorporates various principles of narration outlined by Hayden White in his essay “The Value of Narrativity in the Representation of Reality”. I will argue that, as a work of popular history, Reed’s account of the Revolution does not fit in White’s theoretical framework since it presents elements of both narration and narrativization. Specifically, elements such as the author’s usage of dialogue, the incorporation of specific grammatical features, and the omnipresence of the narrative structure reveal the author’s ideological support for the Revolution. As iterated by White in “The Value of Narrativity in the Representation of Reality”, Reed relies heavily on narrativization in his recollection of the Revolution. Narrativization is the process through which the historian shapes his accounts to adopt a framework similar to that of a story. In other words, narrativization attempts to make the events speak for themselves within a linear timeframe. The author accomplishes this in two ways, namely by filling in the gaps of the historical narrative with his own observations and by presenting the reader with and introduction, and most importantly, a conclusion to the Revolution. Firstly, Reed follows a similar outline throughout the chapters in his book. He begins with extracts of various headlines, which he selects from newspaper articles or official governmental records. He then fills in the gaps created between these sources with his own recollections. Moreover, Reed heavily relies on dialogue, which shapes the events into the mold of a story. Reed’s ideological support for the Revolution is portrayed by his insistence on giving the proletariat a voice in his book to emphasize the importance of socialist ideologies. He focuses particularly on dialogues between soldiers and other members of the masses. For example, the author recounts the words of soldiers expressing their frustration with “dirty work like desertion” and how “every deserter is a traitor and should be punished”. Secondly, Reed introduces the events of the Revolution by explaining the causes of the March Strikes and concludes with what he describes as the “victory of Socialism” in Russia. Introductions and conclusions are innately alien to the process of historical writing; their solely purpose in the book is to satisfy the reader’s need for structure and closure. However, it undermines the continuity of the historical process because history is not static and linear but rather allows historians to better comprehend the present. Overall, Reed’s usage of dialogue and his incorporation of an introduction and conclusion to recount the Bolshevik Revolution is evidence of the process of narrativization. Reed’s novel does not fit the theoretical framework established by White since his recollection also incorporates elements of narration as well as narrativization. In his essay on the value of narrativity, White states that, in the process of constructing a narrativized history, events are chronologically recorded, “truly there is no longer a narrator”. Reed clearly operates outside the framework outlined by White since he is an active participant in the story. As a first-person narrator, Reed engages in dialogues with many other combatants as well as non-combatants and recounts the conversations verbatim, which undermines the validity of the book as an historical source. In this case, the author’s usage of narrative is problematic since, as explained by White, Reed gives “real events the form of story.” By doing so, Reed acts as an omnipresent narrator. Historical figures of the Bolshevik Revolution are perceived as characters following the plot line of a story rather than individuals having truly experienced the Revolution. Since the author assumes the role of omnipresent narrator, he speaks freely about events that he did not witness reinforcing the doubts of the reader as to the value of the book as an historical source. For example, the author describes an interaction between Kerensky and Avksentiev at the Winter Palace giving the impression that he was physically present at the event. Acting as an omnipresent narrator, Reed’s account of various events is brought into question by historians, thus emphasizing the role of the book as a from of popular rather than academic history. The author’s particular engagement with the historical material cited in the book blurs out the distinction between narration and discourse in a way that demonstrates his subjectivity. As stated by White, grammatical features can differentiate between two modes of discourse: one that is subjective and one that is objective. Although most of the book is written in the third person indicating a narrative structure, the author’s usage of the pronoun “I” and adverbial indicators such as “tomorrow” allows the reader to deduce that the book adopts, at specific instances, a subjective mode of discourse. The most effective way of perceiving Reed’s subjectivity is through his usage of nomenclature reflecting his political stance on the Revolution. Words with a positive connotation such as “liberty” and “glorious” are simply two examples amongst many that the author employs throughout the book. What is particularly striking is that the author describes the proceedings of the Bolshevik Revolution as a “marvelous adventure” although famine and military conflict remained widespread. Nevertheless, in a personal statement, the author admits that his sympathies were not neutral but that he remains committed to the truth, “although quite subjective as a concept.” Even though the author is aware of his bias, his selective usage of nomenclature demonstrates his failure to distance himself from the events. Furthermore, due to its subjectivity, historians have often debated over the value of this book as a historical source. When considering the book in its entirety, the author incorporates some elements of proper historiography such as a timeline, taken from the annals form of historical writing, and definitions of specific terms associated with the Revolution. Although this book is a product of historical writing, it is more fitting to categorize it as a work of popular history due to the author’s usage of specific grammatical features and bias nomenclature. 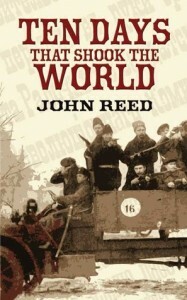 Reed’s “Ten Days That Shock the World” provides the reader with a romanticized account of the Bolshevik Revolution. Operating somewhere between narration and narrativization, the author’s account does not comply with the theoretical framework set out by White in his essay on the value of narrativity. Specifically, the author’s attempt to fill in the gaps created by the selection of historical sources, his usage of specific grammatical features, and his presence as an omnipresent narrator demonstrates his ideological support for the Revolution thereby discrediting it as a work of academic historical writing. Although the book is riddled with the author’s bias interpretations and remains a clear example of popular history, it should not be completely dismissed by academic historians. The historical profession will always be confronted with problems of subjectivity and historians should strive to incorporate sources of popular history in their writings to develop a holistic understanding of the events at hand. Reed, John. Ten Days That Shock the World. London; Penguin, 1977. White, Hayden. “The Value of Narrativity in the Representation of Reality.” in The Content of the Form. Baltimore, MD: Johns Hopkins University Press, 1987. Hayden White,“The Value of Narrativity in the Representation of Reality,” in The Content of the Form (Baltimore, MD: Johns Hopkins University Press, 1987), 6. John Reed, Ten Days That Shock the World (London; Penguin, 1977), 138. White,“The Value of Narrativity in the Representation of Reality,” 7. Reed, Ten Days That Shock the World, 150. White,“The Value of Narrativity in the Representation of Reality,” 8. Reed, Ten Days That Shock the World, 82. Reed, Ten Days That Shock the World, 13. Published by Laura Madokoro on February 16, 2017 at 4:37 pm under Uncategorized.